Although labelling requirements are relatively mild regulatory tools, they may impose considerable commitments upon the obligated parties. Nevertheless, EU law increasingly relies upon labelling to govern risks in different areas of life.3 The labelling of nano-products has been a demand at member state4 and European level5. While such ambitions in member states – often with a reference to the European level – have come to a standstill,4 there are already explicit European nano-labelling obligations for cosmetics, food and biocidal products. The present dossier outlines the international debate as well as existing voluntary regimes, analyzes nano-labelling obligations within EU law and presents unsuccessful efforts at labelling for electrical and electronic appliances as well as for novel foods. With regard to nanotechnology, labelling has also been called for on numerous occasions. Back in 2004, The Royal Society & The Royal Academy of Engineering (UK) proposed the inclusion of synthetic nanoparticular materials in the list of components and/or contents of consumer products.9 On the one hand, experts argue that chemicals in the form of nano-particles should be treated as new substances. On the other hand, there is a need for transparency and information. The Canadian environmental protection organisation Action Group on Erosion, Technology and Concentration (ETC-Group) assesses the risks of synthetic nano-materials as high and called for a moratorium as early as 2003.10 In 2006, the organisation set up a competition to find a “nanohazard symbol” for labelling products or transport containers and for installing warning notices in laboratories and factories. A number of countries have held public discussions, polled citizens or held consumer conferences on the topic of nanotechnology. The German Bundesinstitut für Risikobewertung (BfR) held a consumer poll in 2006.12 The consumer group consisting of 16 citizens urged producers to list particle size alongside ingredients for cosmetics, and to label nano-refined textiles. The Zentrum für Technologiefolgen- Abschätzung (TA-SWISS) held what were known as publifocus events on the topic “Nanotechnologien und ihre Bedeutung für Gesundheit und Umwelt” (“Nanotechnologies and their importance for health and the environment”) throughout Switzerland. TA-SWISS asked randomly-chosen citizens if a uniform declaration would be necessary.13 The discussion events revealed a huge demand for information. There was concern amongst the participants that they had already unknowingly bought products with synthetically manufactured nano-particles. The majority called for an obligation for novel products to be declared. The British consumer protection organisation Which? organised a consumer conference at the end of 2007.14 The participants called for the labelling of cosmetic products containing loose nano-particles. To avoid confusion, the participants demanded better information on nanotechnology. Which? also carried out a survey on the issue of “Nanotechnology” in 2008. 67% spoke out in favour of the clear labelling of cosmetics and personal care products manufactured on the basis of nanotechnology. In July 2007, 70 civil-society groups, environmental associations and labour unions of different nations presented their “Kriterien zur Kontrolle von Nanotechnologie und Nanomaterialien” (“Criteria for the control of nanotechnology and nano-materials”).15 The signatories emphasised that specific instruments were necessary in order to evaluate and control nano-materials. This included labelling consumer products containing nano- materials, information rights and safeguards at the workplace as well as an openly accessible database on health and security information. In Austria, Ärztinnen und Ärzte für eine gesunde Umwelt, die Umweltberatung, the Österreichische Ökologie-Institut and the Verein für Konsumenteninformation (VKI) published a position paper in December 2007, which called amongst other things for general and easily comprehensible information on nano-products.16 The packaging should provide information on nano-materials for consumers and advisory organisations. The Verband der deutschen Lack- und Druckfarbenindustrie e.V. has commented that a specific nano-label would cause a substantial shift in the EU philosophy of only highlighting dangerous materials and compositions.22 As nano-particles are not in principle dangerous by their nature, undifferentiated labelling could stigmatise and malign nano-materials in general. This would counteract opportunities in nanotechnology, such as to reduce the burden on the environment. For this reason, the German coating and printing ink industry speaks out against general nano-labelling. However, voluntary labelling for certain coatings and paints – in connection with the long-established voluntary product declaration – would be worth discussing. One example is the forumnano-Gütesiegel – an initiative by medium-sized German companies based in Frankfurt/Main launched in January 2008.24 Since 2008, the quality seal has only been given to two products, one of which has already been withdrawn from the market. 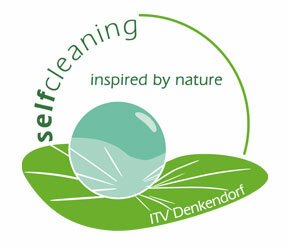 The Institut für Textil- und Verfahrenstechnik (ITV) in Denkendorf (Germany) together with the trademark owner Prof. Barthlott have developed a quality seal for self-cleaning textiles (e.g. awning fabrics)27:28 “Selfcleaning inspired by nature”. The test procedure includes whether superhydrophobia occurs, whether the material is durable and whether the surface structures at issue are present. Information on which companies’ products have so far received the label is not available. The introduction of this new technology on the market should be open and transparent. The BSI recommends different labelling for consumer products, nanoparticles for professional application and for use on the wholesale market. The instruction includes examples of the relevant text information. These proposals have not been taken up by the industry. While as yet there are no labelling obligations for nano-products at national level,4 the situation is different at EU level. The new European Cosmetics Regulation came into force on 1.1.2010.41 It also includes nano-specific provisions.42 As an EU regulation the provisions are directly applicable in all member states. Apart from specific safety assessments and notification obligations,43 it also provides for nano-specific labelling requirements44. Substances that correspond with the nano-definition (see below) are to be included in the list of ingredients and the word “nano” to be put in brackets. This is usually included on the product label, although exceptions are possible in cases where this is justified. To provide for a uniform labelling, the EU is creating a glossary of common ingredient names, which also includes nano-materials.45 The labelling of nano-materials is to follow the name used within the glossary; should no uniform name be available yet, a generally accepted nomenclature is to be used.46 As only labelled cosmetics are considered safe,47 nano-products may only be marketed provided that they are specified as such. The labelling requirements shall apply from 11.7.2013.48 From this date on, all nano-materials used in production are to be included in the list of ingredients. Concretely, there exists a labelling requirement for ingredients containing nano-materials. The word “nano” is to be put in brackets next to the nano-material in question. The labelling requirements address food business operators across the entire food chain.62 The food business operators or the importers are responsible for proper labelling.63 According to the Feed and Food Control Regulation,64 the control and surveillance of the obligations arising from the Food Information to Consumers Regulation lies with the member states as well as enacting potential sanctions (Art. 55 of the Feed and Food Control Regulation). The Food Information to Consumers Regulation has been in force since 12.12.2011 and will be applicable from 13.12.2014 onwards. However, the Regulation contains various transitional provisions: For example, foods placed on the market and labelled before 13.12.2014 may continue to be marketed.65 This measure aims in particular at not placing a disproportionate burden upon food operators. The three EU regulations portrayed above contain different definitions of nano-materials. At first sight this appears justified, considering that different nano-materials require different treatment. However, excessive divergences in the various legal materials are harmful for legal unity. This is one of the reasons why the European Commission issued a non-binding recommendation containing a working definition for nano-materials in October 2011.82 Although the recommendation itself takes as a premise that existing provisions are to be left untouched, the Commission is required to consult its own recommendations when drafting new regulations or revising existing legislation. The Food Information to Consumers Regulation also only includes intentionally made nano-materials. Extraordinarily enough, this definition does not follow the recommendation for the definition of nano-materials made by the Commission84 although they were issued simultaneously. It departs significantly from the definition given in the Cosmetics Regulation: the size restriction is only limited upwards and even there irregularities are possible (in cases in which “characteristics of the nanoscale” appear in structures larger than 100 nm). In this way, the EU has responded to criticism regarding the cosmetics law that a strict 1-100 nm delimitation is not an appropriate criterion.85 By including larger structures such as agglomerates and aggregates, the definition is also a reaction to the fact that, apart from size, specific properties are relevant. However, it retains “properties that are characteristic of the nanoscale”. These include “i) those related to the large specific surface area of the materials considered; and/or ii) specific physico- chemical properties that are different from those of the non-nanoform of the same material”. Unlike the definition in the Cosmetics Regulation and the Food Information to Consumers Regulation, the definition of nanomaterial in the Biocidal Product Regulation follows that proposed by the Commission in its recommendation.84 According to this, nano- material is a natural or manufactured active or non-active agent “containing particles, in an unbound state or as an aggregate or as an agglomerate and where, for 50% or more of the particles in the number size distribution, one or more external dimensions is in the size range 1 nm-100 nm. Fullerenes, graphene flakes and single wall carbon nanotubes with one or more external dimensions below 1nm should be considered as nano-materials”. A particle is considered to be “a minute piece of matter with defined physical boundaries”; agglomerates are “a collection of weakly bound particles or aggregates where the resulting external surface area is similar to the sum of the surface areas of the individual components” and an aggregate “a particle comprising of strongly bound or fused particles”. The efforts in the field of novel foods had already been more advanced. In 2008, the Commission proposed a Novel Food Regulation.90 In the course of revision efforts, the Parliament consequently advocated for a systematic labelling requirement for novel foods. The Commission and the Council, on the other hand, argued in favour of demandbased labelling.91 The labelling of food packaging was also discussed, the Council always presenting the view that this should be regulated within the framework of the Food Packaging Regulation. Irrespective of the different lines of discussion, the revision finally failed in 2011. For several years now, environmental and consumer protection organisations in particular have called for the labelling of “nano-products” to enable consumers to make informed purchasing decisions. While voluntary initiatives can be regarded as having failed due to opposition from industry – and probably also a lack of demand from the consumers up until now – the coming years will see labelling requirements for certain product groups through provisions of EU law. Within the EU, a model for labelling has been established; the provisions in question hardly differ from each other. Accordingly, nano-substances need to be labelled and the word “nano” added in brackets. An obligation to indicate possible risks is so far only intended for biocidal products. There are, however, differences as to what nano-materials are. Although legal uncertainties exist, this seems justified or even necessary considering the fact that there are strong divergences in application. Within the separate legal materials, the power of definition is delegated to the administration (the Commission, so to speak), but not in all aspects. The legislator obviously wants to keep the question of what constitutes a nano-material within the field of legislation, given that the question is not just technically but also politically relevant. Industry is responsible for proper labelling. Depending upon law and subject matter, the persons who primarily bear responsibility vary. Control, monitoring and sanctions are, however, within the competence of the member states. Due to the relatively high effort involved in labelling, the obligations are indeed controversial. The industry needs to comply with them alongside extensive product information for security assessments and possible registration requirements. Additionally, only evidently risky products originally needed to be labelled within the EU framework and this labelling should to some extent have replaced governmental risk assessment. If now only a few product groups are generally labelled irrespective of whether a certain material or product proves to be a risk, whether it has undergone risk assessment or has even been subject to an authorisation procedure, this leads to unequal treatment of different material and product groups. Furthermore, it would have the unwelcome effect of making risk regulation opaque, thus possibly leading to systemic weakness. What the effects of labelling are depends largely upon the renown of certain technologies within society. 1 See Wagner, Kennzeichnungspflichten bei gentechnisch veränderten Lebensmitteln und wettbewerbsrechtliche Aspekte der Negativkennzeichnung, RdU 2002, 3 with further references. 2 For the sector of food-labelling see the substantial analysis by Grube, Verbraucherschutz durch Lebensmittelkennzeichnung? Eine Analyse des deutschen und europäischen Lebensmittelkennzeichnungsrechts (1997); see also the examples given by Schlacke, Auf dem Weg zu einer Informationsverfassung für Produktrisiken, in Albers (ed. ), Risikoregulierung (2011) (Endnote 6) 123, 126. 3 On this see for example Grube (Endnote 2). 4 In particular, see NanoTrust Dossier 018en and the Austrian parliamentary questions on nanotechnology contained therein. 5 On this see also NanoTrust Dossier 017en as well as COM (2005) 243. 6 On this see also Albers, Risikoregulierung im Bio-, Gesundheits- und Medizinrecht, in Albers (ed. ), Risikoregulierung im Bio-, Gesundheitsund Medizinrecht (2011) 9, in particular 16f. with further references. 7 On this see also Schlacke (Endnote 2) 123ff. On the role of information also see Schoch, Information und Kommunikation im Lebensmittelrecht: Europarechtliche und verfassungsrechtliche Grundlagen staatlichen Informationshandelns und privater Informationspflichten, ZLR 2010, 121. 8 On this see for example the possibilities of labelling of the Food Information to Consumers Regulation (Endnote 57). 9 Cf. The Royal Society: “Nanoscience andnanotechnologies“ (pdf), 73, Item 26. 10 See ETC-Group: “Size matters. The Case for a global moratorium” (pdf), 14.4.2003. 12 See BfR Verbraucherkonferenz zur Nanotechnologie in Lebensmitteln, Kosmetika und Textilien. Verbrauchervotum zur Nanotechnologie, 20.11.2006. 13 See TA-Swiss: publifocus zu Nanotechnologien. Chancen und Risiken frühzeitig diskutieren. Medienmitteilung, 12.7.2006. In this context see also Burri, Deliberating Risks under Uncertainty: Experience, Trust, and Attitudes in a Swiss Nanotechnology Stakeholder Group, NanoEthics 2007, 143. 15 See "Kriterien zur Kontrolle von Nanotechnologien und Nanomaterialien". 17 See "Nanotechnology: Small is beautiful but is it safe?" Joint ANEC/BEUC Position, Juni 2009. 18 See Chancen der Nanotechnologie nutzen! Risiken rechtzeitig erkennen und vermeiden! (pdf) Positionspapier des Öko-Instituts e.V., Juni 2007. 19 See "Forderungen des BUND zum Einsatz von Nanomaterialien"
20 See Gegen Nano in Sonnencremen. 21 See Innovationsgesellschaft, St. Gallen/Schweiz: Konferenzbericht 5th Internationale “NanoRegulation” Conference, “No Data, no Market? Challenges to Nano-Information and Nano-Communication along the Value Chain”; Workshop I: “Nano-labelling in Consumer Products”; January 2010, 38 and 39. 23 On this see also NanoTrust Dossier 016en. 26 See Übersicht zertifizierter Produkte. 27 See NanoTrust Dossier 020en. 28 See "Große Resonanz beim Denkendorfer Nano-Forum" (link no longer available). 30 See “Guidance on the labelling of manufactured nanoparticles and products containing manufactured nanoparticles” (PAS 130:2007). 31 See "Safe Sunscreen Guide update". 32 See "Sunscreen guide recalled, as 'Nano-Free' labels in doubt". 33 See Soil Association organic standards. 34 See "Naturland verbietet Nanomaterialien". 35 See, e.g., Art. 3 (1) of the Food Information to Consumers Regulation (Endnote 57). On responsible consumers with regard to the labelling of genetically engineered products, see also Burchardi, Risikoregulierung im Umgang mit gentechnisch veränderten Organismen (GVO), in Albers (ed. ), Risikoregulierung (2011) 79, 100f. 36 In this regard see, e.g., Art. 1 (1) of the Food Information to Consumers Regulation. 37 See Eisenberger, "Kleine Teile, große Wirkung? Nanotechnologieregulierung in der Europäischen Union (2010)" (pdf) with further references. 38 See, e.g., Rourke, European food law3 (2005) 55ff. 39 On this, cf. for example Albers, (Endnote 6) in particular 16 with further references. 40 On this, see, e.g., Wagner (Endnote 1) 3. 42 See Eisenberger (Endnote 37) 15ff. with further notes; Bowman/van Calster/Friedrichs, Nanomaterials and regulation of cosmetics, Nature Nanotechnology 2010, 92. See also NanoTrust Dossier 008en. 43 See Eisenberger (Endnote 37) 18ff. with further references. 44 Art. 19 (1) (g) of the Cosmetics Regulation. 45 Art. 33 of the Cosmetics Regulation. 46 Art. 19 (6) of the Cosmetics Regulation. 47 Art. 3 (b) of the Cosmetics Regulation. 48 Art. 40 (2) of the Cosmetics Regulation. 49 Art. 4 (3) – (5) together with Art. 5 (1) and Art.19 (1) (g) of the Cosmetics Regulation. 50 Art. 6 (2) of the Cosmetics Regulation. 51 Art. 22 of the Cosmetics Regulation. 52 § 24 LMSVG. For further study see Hauer, Lebensmittelrecht, in Holoubek and Potacs (eds. ), Handbuch des öffentlichen Wirtschaftsrechts. Bd. II2 (2007) 571, 599ff. 53 Art. 25 of the Cosmetics Regulation. 54 Art. 28 (1) of the Cosmetics Regulation. 55 Art. 37 of the Cosmetics Regulation. 56 The original draft by the Commission, COM (2008) 40, dated from 2008. 58 Art. 18 (3) of the Food Information to Consumers Regulation. 59 Art. 3 (1) of the Food Information to Consumers Regulation. 60 Art. 9 of the Food Information to Consumers Regulation. 61 Art. 15 of the Food Information to Consumers Regulation. 62 Art. 1 (3) of the Food Information to Consumers Regulation. 63 Art. 8 of the Food Information to Consumers Regulation. 65 Art. 54 (1) of the Food Information to Consumers Regulation. 66 See on this for example the press release of the EU Environment-Commissioner of 20.1.2012, MEMO/12/26. 68 On this see MEMO/12/26. 69 Art. 97 of the Biocidal Products Regulation. 70 Art. 94 of the Biocidal Products Regulation. 71 Art. 19 (1) (f) of the Biocidal Products Regulation. 72 Art. 25 of the Biocidal Products Regulation. 73 Art. 65 (3) of the Biocidal Products Regulation. 74 Art. 69 as well as Art. 58 of the Biocidal Products Regulation. 75 Art. 69 (2) (b) of the Biocidal Products Regulation. 76 Art. 58 (3) of the Biocidal Products Regulation. 77 Art. 69 (2) (b) of the Biocidal Products Regulation. 78 Art. 65 of the Biocidal Products Regulation. 79 § 34 (1) Biocidal Products Act, Federal Gazette I 105/2000 as amended from time to time. 80 § 34 (4) Biocidal Products Act. 81 On this see Art. 87 of the Biocidal Products Regulation. 83 Cf. Eisenberger, (Endnote 37) 17ff. with further references. 84 Cf. on this 2011/696/EU. 85 Cf. Bowman/van Calster/Friedrichs (Endnote 42) 92 as well as Eisenberger (Endnote 37) 17 with further references. 87 See the press release of the Environment Committee of 2.6.2010. 88 Cf. Eisenberger (Endnote 37) 18. 90 COM (2007) 872 of 14.1.2008; see Eisenberger (Endnote 37) 21f. 91 On this see extensively with further references Eisenberger (Endnote 37) 23. By NanoTrust, Austrian Academy of Sciences. NanoTrust Dossiers are published irregularly and contain the research results of the Institute of Technology Assessment in the framework of its research project NanoTrust. The Dossiers are made available to the public exclusively on epub.oeaw.ac.at/ita/nanotrust-dossiers.